Risk is something that weighs heavily in our lives, from news stories extoling the likelihood of catastrophic events, to the many decisions we make ourselves based on perceived risk in certain situations. While always of academic interest, in recent times research insights in psychology and other behavioural sciences have opened new avenues for improving the efficacy of public policy in order to increase public welfare. This new toolbox extends far beyond the popularly understood and marshalled intervention of choice defaults, known as nudging. As a result, a recent seminar hosted at City University London brought together leading researchers to critically consider the potential of their work to impact a broad and diverse set of global policy problems, including terrorism, pension planning, and climate change. The psychology of risk came under particular focus with Professor Peter Ayton from the Department of Psychology at City University London and Paul Slovic, Professor of Psychology at the University of Oregon and president of Decision Research discussing various aspects. In his talk, Professor Ayton spoke about how people respond to catastrophic events and in particular about dread risk, which refers to the risk of catastrophic events, and terrorism. Speaking about how people reacted to events such as September 11, the 2004 Madrid bombing and July 7 bombings in London, he spoke about how dread risk can change patterns of behaviour often resulting an increased risk of hazardous events occurring for individuals. One such example was a paper by Gigerenzer et al which estimated that 1,595 Americans died on the road post September 11 in an attempt to avoid the fate of the passengers killed on the four fatal flights. The suggestion is that dread risk resulted in more deaths on the roads compared to the expected period after attacked. This phenomenon was also seen in London after the July 7 attacks on the capital. 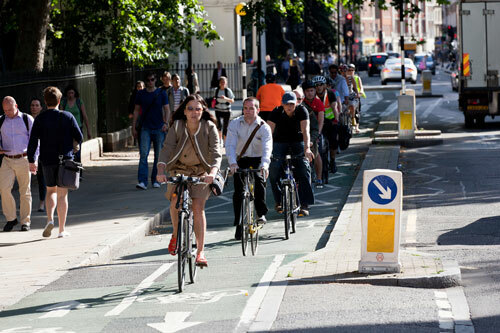 After the attacks in July 2005 many people switched to cycling after the attacks on the tube thinking it would be safer, but in fact it resulted in a greater chance of serious injury and death due to increased risk of cycling on London’s road. Working with Professor James Hampton at City to map the data, a clear dread risk effect was seen as while underground use decreased following the attacks, cycling traffic increased along with corresponding cycling casualties. As a result, in attempt to reduce risk by avoiding the tube, it was in fact increased. This theme of risk, and in particular the psychology of such risk, was picked up by Professor Slovic as he spoke about how trust is central to risk perception, and how our gut and intuitive feelings about certain events or scenarios determines our approach to risk. This can have interesting effects when members of the public and experts are asked to rank the relative risk of things such as nuclear power, cars, guns, x-rays etc. The outcome is that often experts rank the risk of certain things differently to lay people, with members of the public tolerating perceived risk from natural disasters much more than human sources. Terrorism has particular dread factor, as according to Professor Slovic it “hits all the risk perception hot buttons”, but often it is the behavioural cost than dwarfs the physical impact of terrorism. Lastly, Professor Slovic turned to address why we will often do so much to save an individual life but will not save many lives. According to Professor Slovic we are affected by ‘psychic numbing’, as we can often become immune or numb to statistics even if they refer to tragic events. Using the recent example of the migrant crisis in Europe, it took a tragic image of a dead boy on a beach – an individual – for people realise the severity of the situation. Research showed that following the picture gaining media exposure, the amount of charity donations increased dramatically. When it comes to top-level decision making in governments, there is another effect which may explain inaction. According to professor Slovic, something known as the ‘prominence effect’ explains why top decision makers – who are aware of the stats, situation and huge potential loss of life – often do not act, as it is safety and security that is the overriding priority. As, in the word of Professor Slovic, “they are more likely to protect national security than the nameless, faceless stats to which we are numb.” He went on to say that hopefully behavioural public policy can solve these problems. Molly Crockett (Oxford University) - "The Price of Principles"